Lymphocyte. 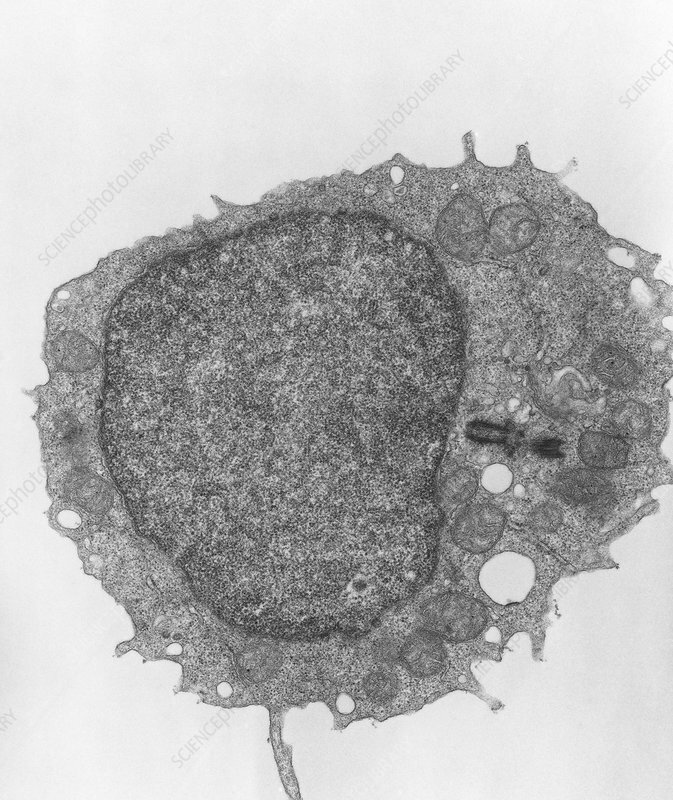 Transmission Electron Micrograph of a human lymphocyte, a type of white blood cell involved in the body's immune response. The large darker area is the nucleus, which contains the chromosomes. The dark oval areas are mitochondria, which provide the cell with energy from aerobic respiration. There are 2 main types of lymphocyte: T-cells and B-cells. T-cells are derived from the thymus gland and give rise to a cell-mediated response, by destroying pathogens (as cytotoxic or killer T-cells) & by summoning killer macrophages. B-cells are made in the bone marrow & provide an immune response by secreting specific antibodies. Magnification: x29,700 at 10x8 inch size.